We provide woodland management and forestry services for private, corporate and institutional clients throughout Greater Manchester and the North West. (These services used to be delivered under trading name of Ecos and Ecos Consulting.) Both our consultancy and contracting services cover all scales of operations, and are delivered in compliance with our values and to our high standards. 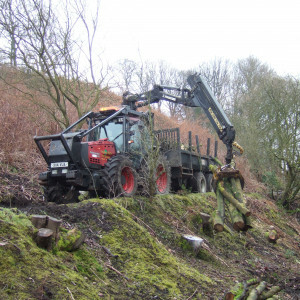 Woodland management and forestry works are dealt with by Phil Benn and Paul Hodgson, who have a combined expertise in producing management plans and all aspects of contracting operations. With a solid foundation in both academic and practical training and qualifications, coupled with many years experience of woodland and forestry work, the TreeStation team is able to offer a seamless transition from assessment to actual work on the ground. We work to the highest environmental and safety standards. Contact us to discuss your enquiry! We work closely with our customers, tailoring our approach to suit their objectives and the specific characteristics of the woodland itself. We carry out all our woodland management & forestry operations with the aim of bringing woodlands to their best potential and maximising their benefits, which include wildlife habitat and conservation; biodiversity management; erosion & flooding control; recreational & health benefits; appealing landscapes; preservation/increase of carbon sequestration capacity for climate change mitigation; as well as sustainable timber production for furniture or fuel and associated financial benefits. Find out more about the other services we offer, and what we use the arisings for. Applying for grant aid can be an intimidating and complex process but we can identify and apply for grants on your behalf. Grants can be secured throughout the life cycle of woodlands, and may be applicable to specific management operations or particular species. We can assist with preparing a design for regeneration plans based on your objectives, securing grant funding, and undertaking preparatory works, planting and maintenance. If you are looking into purchasing planting land or an existing woodland, we can provide impartial advice on suitable acquisitions based on your objectives and circumstances. (^) We guarantee our advice is always impartial. Although we recommend you combine the use of our in-house consultancy and contracting services for better integration, efficiency and communication, there is strictly no obligation to do so.